Are you suffering from “someday” syndrome—always waiting for someday when your schedule calms down, your finances improve, or your kids grow up so you can begin to live the life you’ve always dreamed of? 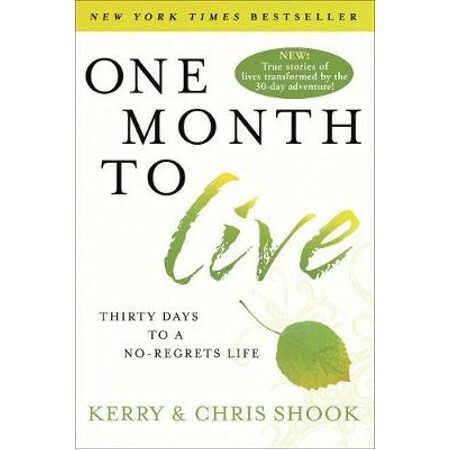 What if you learned you had just one month to live? Without a doubt, you’d stop living on autopilot and determine to make the most of every moment. You don’t have any time to waste. LIVE PASSIONATELY, living each day as if it were your last. LOVE COMPLETELY, showing others love that transcends and transforms. LEARN HUMBLY, growing through your problems and pain. LEAVE BOLDLY, creating a legacy that will impact generations. Each of the thirty chapters—one per day in a life-changing month—offers fresh strategies and tools to experience revitalizing change in core areas of your life. Uplifting true-life stories and thought-provoking questions will inspire you to squeeze all you can out of each day you’ve been given. Stop wasting precious time. Start living today as God created you to live—passionate, fully alive, without regrets.